A robot which is said to be the fastest of its kind when walking has been built by the universities of Glasgow, Stirling and Goettingen in Germany. 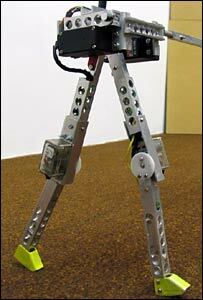 RunBot is 30cm high and walks at the "record-breaking" speed of 3.5 leg lengths per second. The "minimalist" robot uses only a handful of sensors and neurons to establish walking and can adjust speed. An understanding of walking is important for researchers who work with patients with spinal injuries. RunBot was developed by Stirling PhD student Tao Geng under the supervision of Dr Bernd Porr, of the University of Glasgow's electronics and electrical engineering department. Dr Porr said: "We wanted to show that natural walking can be established by combining simple reflexes. "The robot uses reflexes which are triggered when a foot touches the ground which then makes the other foot lift and so on. "The robot can adjust its speed when it is running up or down a slope which looks very natural and human like." He added: "We have also shown that these reflexes can drive learning to improve walking behaviour."